RUPES BigFoot Nano iBrid Soft, Medium & Hard Cup Brush Mix & Match Trio gives you the choice of hard, medium or soft brushes in a great trio bundle deal. 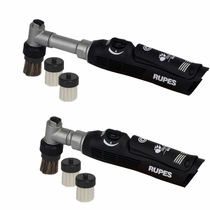 The RUPES BigFoot Nano iBrid Soft, Medium & Hard Cup Brushes have the power to safely clean hard to reach tight areas inside and out on your RUPES BigFoot Nano iBrid Random Orbital Polisher. Featuring stiff bristles RUPES BigFoot iBrid Nylon Hard Cup Brush is great for cleaning exterior plastic trim and hard to reach grimy areas such as engine compartments and wheels. 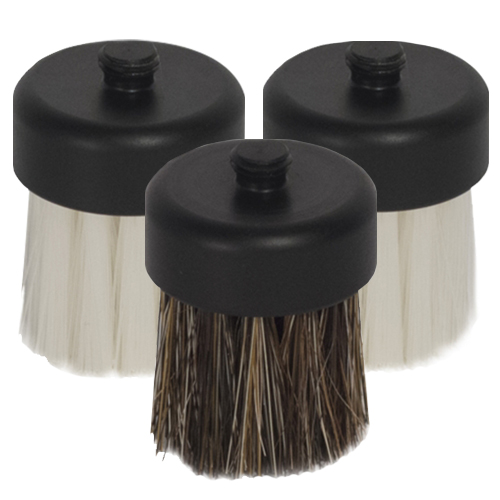 The RUPES BigFoot Nano iBrid Horsehair Medium Cup Brush has medium bristles and is great for cleaning interior surfaces such as leather, vinyl, plastic & upholstery as well as plastic trim with your favorite interior cleaner. RUPES BigFoot Nano iBrid Nylon Soft Cup Brush has soft bristles for gently cleaning of interior surfaces such as leather, carpet, vinyl, upholstery and plastic. Cleaning: Gently wash RUPES BigFoot Nano iBrid Soft, Medium & Hard Cup Brushes with mild all purpose cleaner, thoroughly rinse and allow to air dry. Store in a clean area where bristles will not be crushed or bent.